Today Josh has to go to the Orthodontist, it is a consultation visit to let us know exactly what their plan is, so I am not sure how long that will take. Then I need to go to the vet and pick up Molly's flea medicine, they were out when we went last time. Then I guess Josh is going to stay the night with his cousin and go swimming on Thursday. I also need to make sure all of my homework is finished and ready to turn in tomorrow. I will be by to visit at some point today. Have a wonderful day!! 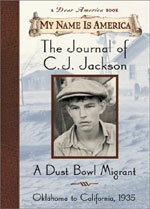 It is another historical fiction book, this one a journal of Sean Sullivan A Transcontinental Railroad Worker. Here is a link to read about the book: Click here. I am glad he has found these books, he really seems to enjoy them. I watched the movie Temple Grandin last night-she is a woman with autism. The movie is on HBO right now, I loved it. Claire Danes plays Temple Grandin. I was glad I watched it. Sometimes it can be very challenging working with children with autism, and this movie was very encouraging and gave me some great ideas to use in the classroom. I get frustrated sometimes, so I needed to see this movie. Well, today I am off to class. This week is the half way mark! Yay!!! It is also my husband Karl's Birthday!!! Happy Birthday Karl!! Have a great day!! I was able to get my homework finished last night. I had a midterm to type and it is ready to turn in. It is not due until Thursday, but I can tweak it if I need to this way. We had crazy thunderstorms last night with lots of thunder and lightening. Mandy is scared of the noise it makes, so she was snuggling with me. Today I need to do laundry and clean house a little. My dad will be taking Josh to their house to stay the night tonight so I can go to class tomorrow. I am enjoying being home some this summer and spending time with Josh. He has been at my parent's or Karl's parents for the past three summer's and I miss him. Josh finished his book, so it looks like we will be heading to the library today. Well, I better go. I will be able to blog today. I will visit you soon!! Have a great week!! We tried to swim yesteray, but it got cloudy and shortly began to rain, so I took a shower and did some homework. I am glad now that it did rain because I got a lot of homework done and I have one more paper I need to type today or tomorrow. It is Midterms this week for summer school...it goes fast huh? I also caught up on some shows I had on DVR. We went to church this morning and now I am watching a baseball game. I cannot believe the 4th of July is next weekend!! That totally snuck up on me. Have a great day!! My class and lab were ok. I tried to get my focus child to do things on the checklist we have assigned and he is not really into it. I do not blame him at all. I need to see him do some things outside and we stayed in again. Today I am taking Molly to the vet for her second appointment of three for her puppy shots. That is about all I have planned. I will be by to visit blogs this morning. Have a great Friday!! I laid out in the sun for a while yesterday, but it was so hot, I just stayed out for about an hour. I was able to give Molly her bath, so that is done for a while. Josh went to his cousin's birthday party. They went to a paint ball place. He said he had a good time. I understand they played paintball, had birthday cake, then ate lunch. They went out of town, so he didn't get home until around 6PM or so and left at 8AM. Today we are going to church. I think we are going to try to put up our pool up. I told Karl in May it was going to be a hot summer. He didn't listen. I also need to call my dad and wish him a Happy Father's Day. I will get to see my dad tomorrow. Have a great day!! Josh is going to his cousin's birthday party today. They are going to do paintball. I am not sure Josh will like it, but he wants to be at the party for his cousin. I need to give Molly a bath today. I have been giving her a bath on Friday, but I got busy yesterday. My nephews all came over yesterday to play with Josh, so there were 3 boys running around the house. They were actually very good, and I was able to clean the house and do laundry. Then we went to get ice-cream and a drink. There was an older gentleman in there and he commented how good the boys were. When we got home, one of them took all of his clothes off except his underwear and did a dance. Good grief!! I am glad they were good when we were out. The boys played games a bit too. Then afterwards Karl, Josh and I had pizza for dinner. That is about it. Have a nice weekend. My class turned out to be a lot more fun that I thought it would be yesterday. We went to the library and our teacher let us look around and find fun curriculum items for our kids. Then in lab, it was a ton of fun. It is usually kind of boring. It was a great day!! Josh was home when I got home, he had fun with his cousins swimming and playing. Today we do not have any plans. I would love to keep it that way. Josh is tired and has a birthday party to go to tomorrow. I might go through my class handouts and see what is coming up next for class to get prepared. Have a wonderful weekend!! Today I have to go to the dentist to get a cavity filled. Have a great day!! Oh, btw...Judy made me all kinds of new siggies!! Thank-youJudy !! We had a nice relaxing Saturday and didn't do too much. We went out to dinner with Karl's sister, her husband and their son last night. It was fun, we ended up visiting for a long time and then Josh spent the night with them. Today we are going to church. We have missed the past two weeks. I was sick one week and Josh's sunburn last week kept us home. Then we need to run to Wal~Mart and pick up something for me to take to class to eat. My class schedule is weird (12-5:30). I am not hungry before I leave for class and I am definitely hungry by the end of the day. I need to plan better. I will take something with me and eat in class. The teacher said that was fine and the class was all eating in class last time. I was starving the other day after class and lab. Let's see, I also need to do laundry and maybe clean a little. Have a wonderful day!! I could have just died last night. I was looking in blogger and there is a new section for design of your blog. Well, I thought I would play with it. It messed up my blog so bad and I couldn't get it back to normal. Then I remembered I have the minima template on my blog for the preschool, so I grabbed it and put it in here at this blog. I was able to get it back to normal pretty quick after that. I just figured they would have kept the old templates too, but they didn't..at least I didn't find them. Karl had to work last night, so Josh and I ran to Walgreens and I picked up some facial masque and I did a facial on myself. I usually do one every week, but I ran out of my masque and I couldn't find any of the other kind I buy, so I found a new one at Walgreens. I also gave Molly a bath. Josh and I never did make it to the library. I do not think we have any plans for Saturday. Maybe we can all relax. Have a great weekend! Wow, it was a busy day yesterday. I went to class, then to my lab. There are 6 kids in the class and they are 2 year olds. Super cute. The bad thing is that in the afternoon when I have my lab the kids have done all of their fun things..singing, storytime, field trips, etc. I am basically there for recess and snack time. I wish I would have known the schedule before I signed up for my lab. I would have chosen a morning lab. It will be fun though. These kids are way easier than the kids I work with at the preschool. Well, I never did have any UTI symptoms yesterday, so I will just have to wait and see what happens. Maybe it is nothing. weird. My back also continues to get better. Today I would like to take Josh to the library to get a different book. He is done reading the book we got last week. Happy Friday!! Have a wonderful weekend!! It has been a while, but when I turned 30, I was doing laundry and I was putting the clothes in the dryer...when I bent over, my back tightened up. I was in so much pain. I could hardly move. Anyway, yesterday right before I went to my class I bent over to pick up Molly and my back tightened up again. It wasn't as bad as it has been in the past. I can walk. I went to class. It feels better if I move and keep it loose. I laid on the heating pad last night while I watched Glee. Do any of you watch that? I watched the first show when it premiered and loved it, then I watched it when it came back and thought it was stupid. Well, I was watching some shows I had taped on the DVD one night and when they were over I turned the tv on and it was when Glee made it's comeback. I have been hooked ever since. Anyway, back to my back. It is a little better today. Just a little stiff. I wanted to read blogs last night, but Karl was watching a movie on the computer. So I wasn't able to get online at all. My class is going to be fun I think. I get to work in a 2 year old room. The material we will learn will be very helpful. I love taking classes where I can actually use what I am learning. This is what happened last year. I decided to take the whole year and take all of the classes I didn't want to take. It was a boring year of classes and I will not use the information that I learned in my classroom, but it is over. I think everything I take now will be enjoyable for me. I have about a year and a half left of classes. Today I take Josh to the Orthodontist. They are taking molds of his mouth. They say they will start with an expander and then he will need braces, so we are getting the process started. He has really messed up teeth, it is strange because Karl and I didn't wear braces. Well, I will go. This has turned out to be a long post. Have a great day! !